Joy Denise's Blog: Saturday, Saturday, Saturday Night's Alright! This was a perfect, low key Saturday night for me! It's how I roll, folks! Dinner out with a coupon: Affordable, quick and no dishes! Yay! Back home and into the "quilting studio"! Karen was set up with laptop for instant messaging with her friends all over the globe (seriously!) and her latest project. I was at the next table...looking much the same! We were joined by the studio "cat", Tiger! She chewed on her bone the entire evening! I continued working on the reconfigured Checkers quilt that I am making out of reproduction fabrics. I wanted to showcase the fabrics (making the checkers larger/easier to see) AND make the quilt large enough for a king sized bed, so I sort of blew up the whole thing. Each checkerboard block on mine is 12 inches, with 3 inch "checker squares". I got the checkerboard part completely done! Tomorrow at quilt class, I will be enlisting the help of Janet Salcido (Teacher Extraordinaire) with the calculations and design of the keyboard border/corner blocks. 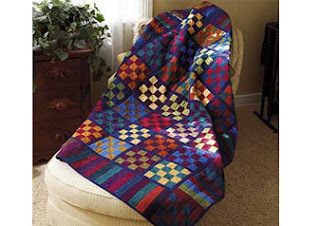 I'm thinking I may go back and make it again, more along the lines of the jewel tones they used for this quilt in the magazine.....for a daybed upstairs. Anyway, it was a fun and relaxing Saturday night! Somebody has been very busy!! I can't believe how fast you put that quilt together! It looks FABULOUS!!! Today I am staying in my jammies and plowing through my projects. Ahhhhhh, don't ya love a day when you have time. GORGEOUS !!! I can't wait to see this one done ! 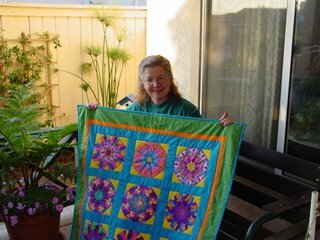 You and Yvette truly amaze me with your quilts. Mine are ok, but you guys are unbelievable. Karene! Hogwash! (about yours being "okay") Your work is wonderful!! I am in awe of the Little Blessings quilt and you did such a great job quilting it yourself! I'm proud of ALL OF US!! We're learning so much and doing a fantastic job! I'm going to be making another quilt in an April class using the reproduction fabrics....it involves CURVES. Terrifying! In a good way! I'll post a pic of the pattern later. I sure wish I could get the kitchen finished (and the stairs) so that I could just concentrate on sewing when I am not working! !